Rachel Adams’s life had always gone according to plan. She had an adoring husband, a beautiful 2‑year‑old son, a sunny Manhattan apartment, and a position as a tenured professor at Columbia University. Everything changed with the birth of her second child, Henry. Just minutes after he was born, doctors told her that Henry had Down syndrome, and she knew in that moment that her life would never be the same. In this honest, self‑critical, and surprisingly funny book, Adams chronicles the first three years of Henry’s life and her own transformative experience of unexpectedly becoming the mother of a disabled child. 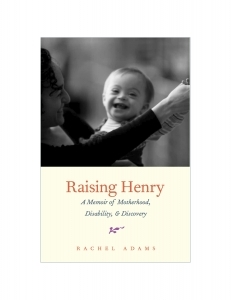 A highly personal story of one family’s encounter with disability, Raising Henry is also an insightful exploration of today’s knotty terrain of social prejudice, disability policy, genetics, prenatal testing, medical training, and inclusive education. Adams untangles the contradictions of living in a society that is more enlightened and supportive of people with disabilities than ever before, yet is racing to perfect pre‑natal tests to prevent children like Henry from being born. Her book is gripping, beautifully written, and nearly impossible to put down. Once read, her (or her family’s) story is impossible to forget. Kelly McMasters, “The Second Son.” Columbia Magazine Winter 2013-14. Claire Potter, Tenured Radical blog. “The Education of Henry Adams: A Review.” 16 December 2013. Susannah Meadows, “A Disability, and a Mother’s Embrace.” The New York Times 16 December 2013. Jerome Groopman, “Unlike Others.” New York Review of Books 10 October 2013. Pamela Wilson, “Writers Raising Children with Down syndrome” Bella Online: The Voice of Women blog. Historiann blog. 17 November 2013. Anne Kaier, Review of Raising Henry. Wordgathering. December 2013. Allison Stevens, “Being ‘Different’ in a World of High Achievers.” Symposium 6 October 2013. The Garden WIndow. October 18, 2013. Manhattanmamma review of Raising Henry in Life Well Said. September 28, 2013. Elizabeth M. Lockwood review of Raising Henry in New York Journal of Books 28 September 2013. Kate Tuttle review of Raising Henry in Boston Globe 21 September 2013. Karen Springen review of Raising Henry in Booklist 16 September 2013. Sarah Toretta Klock, “A Chat with Rachel Adams on Motherhood, Disability, and Discovery,” New York Family Magazine 20 September 2013. Glen Altschuler, “Up from Down” Psychology Today 17 September 2013. Alison Piepmeier, Review of Raising Henry. Every Little Thing 23 May 2013.